Home > Drawing Supplies | Art Mannequins, Skeletons & Other Drawing Models | Human Figure Manikins | Richeson MANIKIN 6"
Richeson MANIKIN 6" A 5 1/2” manikin that totals 6 ¼” with the base included. 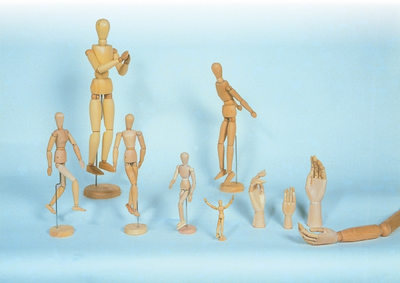 A unisex manikin, this can be used to learn how to draw the human form. Small and portable enough to transport, these are a great training tool. Perfect for art instruction as they are affordably priced, and a great starting point for a new artist or experienced artists who are learning to draw humans. Made from durable hardwood, these manikins are built to withstand wear and tear, even if you travel with them frequently. They are adjustable and easy to work with, and their quality is excellent.